That's the testing world I'm pretty sure. It might be hosted of Ryan's computer or something, That's why it's up. World one should be up soon. That is correct, you guys are free to play on it though when World 1 is down. I'm playing on World 1 now. Hey, how would I play this on Linux since there is no jar file? We can and will add that I'll let you know when we update it! Thank you for pointing that out. This might sound weird, but could you give me the port number and ip address so I can play with my own client, till you have added the jar file? The server is offline, That's why. I believe the ip address is world1.runerebels.com and the port is 43594. 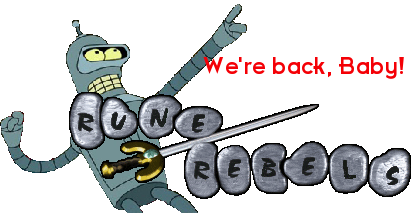 In addition to what Garrett said, If "World1.Runerebels.com" is offline then you can use "World2.Runerebels.com". Download and install WinRar. After that right click the client download and click extract. Anyways, people use the downloadable client it's much faster and doesn't require a browser to be open wasting space. The voices are growing louder. SHUT UP FAMOO! Why does this no longer work for me?